Set amidst chestnut and fir groves, the church has a massive gray facade and colorful stained glass windows. The Chruch is nearby to the bus stand, Constructed by the British family that founded the town of Kasauli itself. It is a magnificent structure built in the shape of a cross. Apart from them, many tourists and travelers also flock here. Earlier, the church was known as the Anglican Church. If you were lucky then you might see shootings of local films or ads shootouts. Regular Sunday morning services are held here till date. Kurisumala Monastery (also known as Kurisumala Ashram). Vagamon Kurisumala Ashram is considered as one of the best pilgrim centers in Kerala where the Christian devotees can lead a meditative and reflexive life. The monastery belongs to the Syro-Malankara Catholic Church. Taking up the cross and reciting the Way of The Cross, devotees climb up the mountain both as a penance for sins and as a way to share the sufferings of Christ. Kurisumala Ashram lies at the foot of Kurisumala which lies about 4000 ft. above the sea level. The Church of Epiphany is another landmark of the village Mawlynnong. the church has recently completed its hundred years and has a unique old charm. Walking along the premises of this church will sooth your mind and soul. The church has beautiful unruly bushes of beautiful orange and red flowers. According to the legends, Welsh Christian missionaries came to this village in the 19th century and since then, the village has been following a strong tradition of Christianity. The Church of Epiphany is the only church in the village and people consider it as one of the most important pa​rt of their life. All the food that you will eat in the village is cooked using locally grown stuff. Every house has a tradition of having its own vegetable gardens. They say it is the missionaries that changed their lives and taught them ways to reach God through cleanliness and thereby winning the title of cleanest city of Asia for itself. Just 1.5km west of McLeod on the road to Forsyth Ganj, this brooding Gothic church (dating from 1852) is one of the few remaining traces of McLeod's days as a British hill station. It’s open on Sunday mornings for a weekly 10am service. The cemetery contains the graves of many victims of the 1905 earthquake, as well as the rocket-like tomb of the Earl of Elgin, the second Viceroy of India. St Theresa's Church was commissioned by a missionary in 1929 by Swiss Jesuits. The church was built by local craftsmen and resembles a Bhutanese monastery. Influence of the Tibetan architectural design can be seen in the structure of the church. Carved apostles which look like Buddhist monks and the carvings on doors which resemble tashi tagye (the 8 auspicious symbols of the Himalayan Buddhism) show the influence of Tibetan architecture. From the church, one has the chance of viewing the scenic Himalayan ranges. The St. Paul’s Church is the most renowned, surviving and functioning church, among the three churches built by the Portuguese in Diu island on the west coast of India, Proclaiming divinity in the quiet town of Diu, the church is easily accessible from the main land from the Portuguese village of Ghoghla or from Somnath. The architecture of this church is famous for being one of those few in the country which is designed in the Baroque style, giving the church its current fame. The church is dedicated to the Lady of Immaculate Conception and is one of the oldest in India. The Church is renowned for its exquisite craftsmanship and elaborate artistry. The image of St. Mary at the altar is believed to have been carved out from a single large piece of Burmese teak. Visit it and light a candle and line it along with hundreds other at the altar. Chalakudy is one of those areas in Kerala with high concentration of the Christian population majority being Syro-Malabar Catholics. St. Mary's Forane Church, is one of the 10 Foranes or deaneries under the Diocese of Irinjalakuda. It is one of the most popular Syro-Malabar Church near Chalakudy which every traveler should visit. It represents the Syro-Malabar Catholics culture. People visit the place often to find inner peace. Solomon's Temple in Aizawl, Mizoram is constructed by a non-denominational church, known in Mizo language as Kohhran Thianghlim which is rendered 'The Holy Church in English. The church was founded by Dr. L.B. Sailo in 1984 and the members are known as 'the elects.' Their mission is to proclaim and disseminate the word of God throughout the world, particularly to the Mizo people through written and spoken means of communication, and they are constructing Solomon's Temple as a symbol of their love of Jesus Christ. The live example of Gothic architecture; the Basilica of the Sacred Heart of Jesus is on the South Boulevard of Pondicherry. Depicting the events from the life of Christ and Catholic church saints are the glass stained panels adorning the walls of the church. Paintings of Joan of the arc and even the one of the best selling singers of America- Madonna. This church is about a century old piece of architectural contribution by the french missionaries. It stands tall even today in its Latin rite cross shape looking over the city. The interior is decently designed, it has few chandeliers and statues of four evangelists with walls and windows with terracotta craftwork. The entrance is blessed with biblical inscriptions. A symbol of Christian heritage is the ancient St. Marys Forane Church in Alappuzha. This catholic church is one of the oldest churches in India, standing erect on the bank of the backwaters. This architectural marvel is a delight for the lost soul with the tranquil ambience inside certain to soothe your senses. The crucifix in the church is unique where you can find Jesus Christ without a single wound. You can also enjoy the week long annual gala, where fireworks will lighten up the sky, giving a sense of liveliness. This place of love and communion has some beautiful murals and sculptures inside the cast cathedral. You can enjoy some nice and quiet time in the peaceful building. Do not hesitate to take home a few souvenirs from the handicraft shops. Have a blissful time in this charming church. All Saints' Cathedral is one of the famous cathedrals in Allahabad. Also known as the Patthar Girija ( Church of Stones) , the All Saints' Cathedral Allahabad is a fine example of Gothic style and architecture. Set in the middle of lush greenery, the church is 31 meters in height. The main attractions inside the All Saints Cathedral Church is the Lantern Tower or the Victoria Tower. The huge construction style, couple of carriage porches and low windows, the roof supported by arches, cream colored stone with alternative red sandstone reflects the work of efficient workmen of those times. One of the most remarkable design in the church is the pulpit. A section of the church depicts various British rulers who died during their reign over India. The All Saints' Church's timing is from 8:00 AM to 8:00 PM every day. The church is a major pilgrim destination in Allahabad. The church is regarded as the best Anglican cathedral present not only in India but also in Asia. The Cathedral mother church for Roman Catholic Archdiocese of Pondicherry it is believed to behold the Sacred Heart of Jesus, which makes the church a great tourist attraction in Pondicherry. The central Altar is lavishly adorned and the interior is decently designed, the facade is all gold and white which makes the overall place pleasingly mesmerizing. The captivating beauty of the exteriors pursue the travelers to pay a visit to what's waiting inside. The mass timings are from 5:15 am to 5:30 pm in Tamil and English. Earlier the church was a small chapel but was demolished twice and rebuilt to finally again a structure what it looks like today a Portuguese style church like that one can see in Goa. Some parts are added in this church later but most are retained in the same form. The spiritual growth experienced in the church premises are still a blessing most visitors are deprived of. But the offbeat place is really a serene wonder. Church of our lady of angels is a well known white chapel in Pondicherry. It is the fourth oldest church in the area. The original structure was built by NapoléonIII in the Greco roman architecture making it outcast the other buildings surrounding it. Located in Rue Dumas, white town in Puducherry is the catholic church that pulls devotees and spiritual intriguers since ages. The elegant white building facing the bay of Bengal is a prominent landmark in Puducherry. The Altar which in modern times houses the holy cross is originally believed to house a statue of our lady of angels. There are also the statues of Joan of arc and of the mother of immaculate conception. Walls are painted with the mixture of paint and egg in limestone. The church even today is under the supervision of the Capuchin priests, the original church monks. The church of our lady of angels implicates a unique aura. This church was built in 1988 with donations from the Parish. 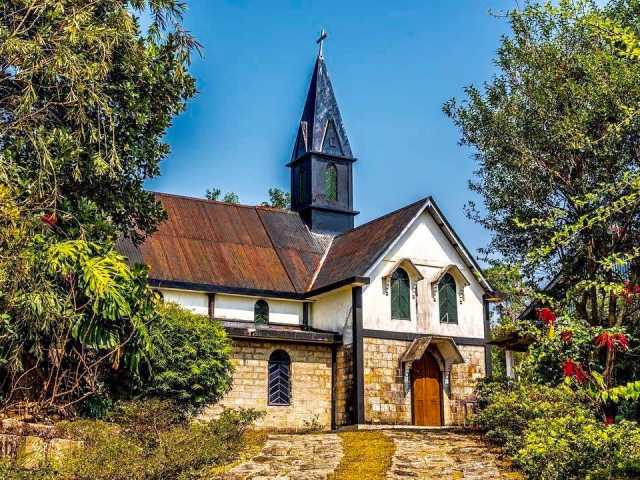 It represents the cultural connect of Christianity in India, particularly in this region as it is today the only church in the area within the radius of about 25 Km. The walls of the church are decorated by cross and other symbols of Christianity. Built back in 1863, St. John church dedicated to St. John is located on Gandhi Chowk in Dalhousie. It is an important landmark in the history of Dalhousie being the first church to be built here. The legendary structure stacked between pine valleys is the prime attraction for Dalhousie tourism. St. John church is brimming with pieces of art, bounties of nature, and cupboards of books and photographs whispering the culture and history of Dalhousie. It is similar to the Roman Catholic church of England besides that it belongs to the Protestants. It beautifully showcases the memoirs of the British regime. The glass paintings of St. John and St. Peter adorn the interiors of the church. The church originally was a wooden structure which transformed into its present form when Rev. John H. Prats convinced the Christian missionaries to do so. It is located near Gandhi Chowk and is open on all weekdays from 7:00 am to 7:00 pm. St. Mary's Church a lovely and a holy place and for every tourist to be there, it brings a lot of charm to the place and surrounding. It is a jewel in the heart of this small hill station, main tourist attraction and people go there to visit and offer up their prayers.